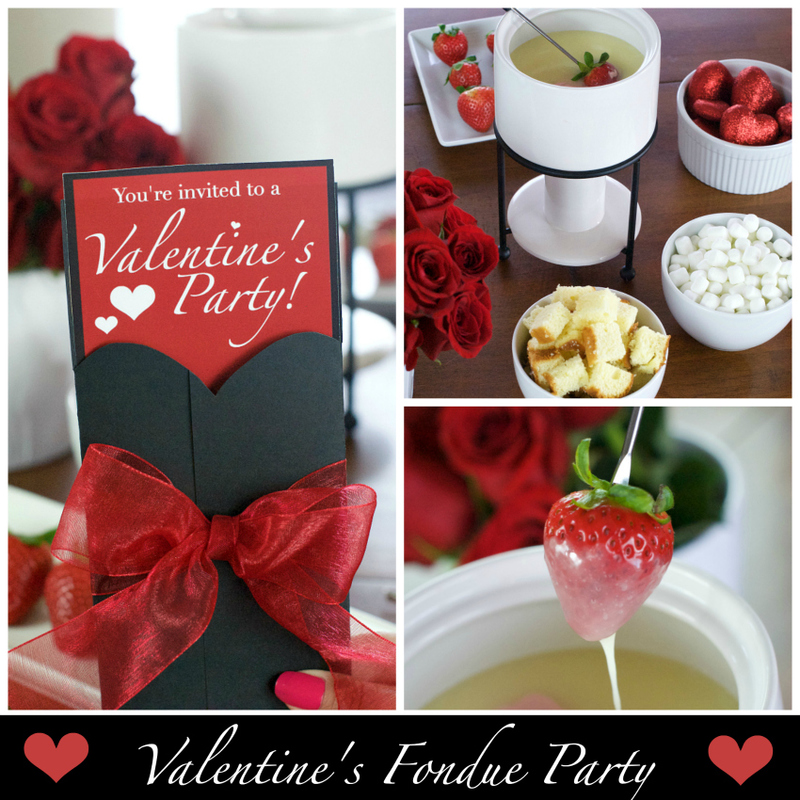 A Peek at the Fun: Throw a fun Valentine’s Day party for couples with this fun and romantic chocolate fondue party. 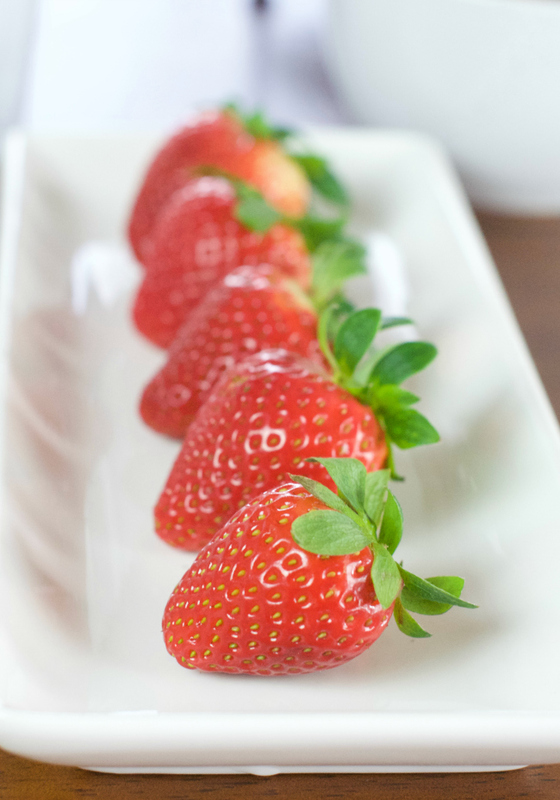 Serve white chocolate and chocolate fondue with fun things to dip in it and entertain your guests with a fun newlywed like game for the couples. 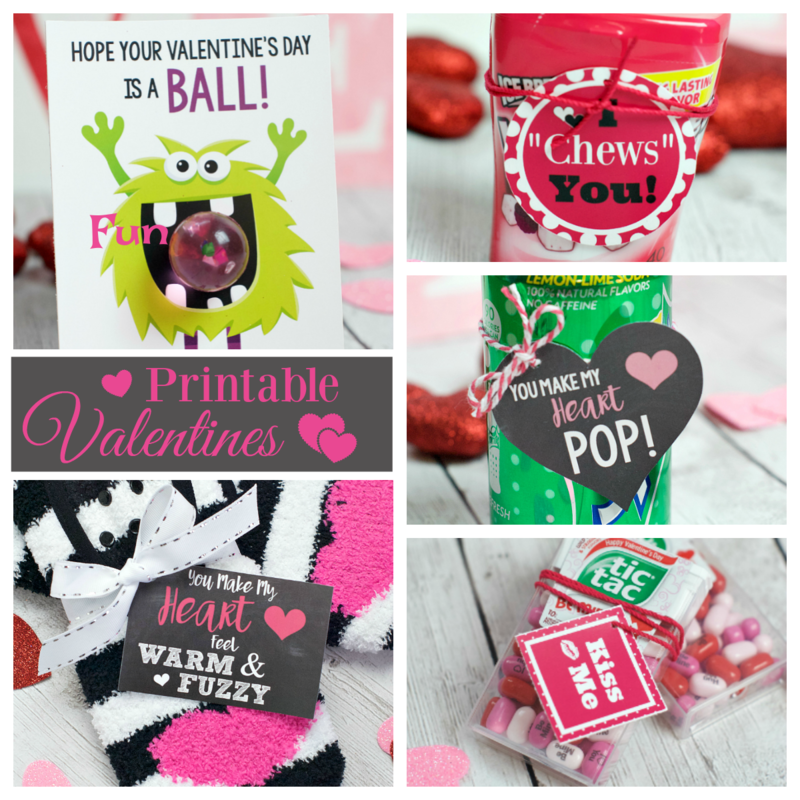 Valentine’s Day is coming…and it’s all about the love here at Fun-Squared! We love, love, love chocolate and will find almost any excuse to eat it so when we need to plan a Valentine’s Day party it’s very simple to decide what to serve! Chocolate fondue is so yummy and such a fun, social dessert. 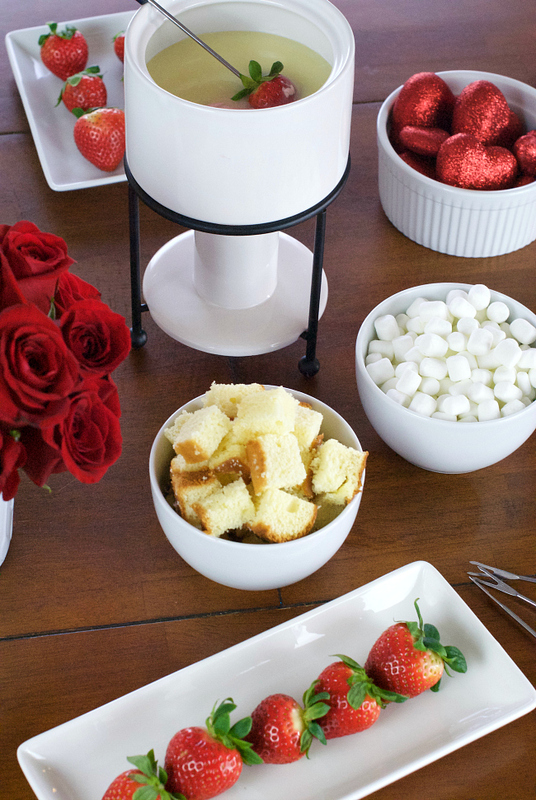 Everyone can gather around a fondue pot full of chocolate, dipping yummy treats and chatting….oh seriously, we are drooling over here just thinking about it. 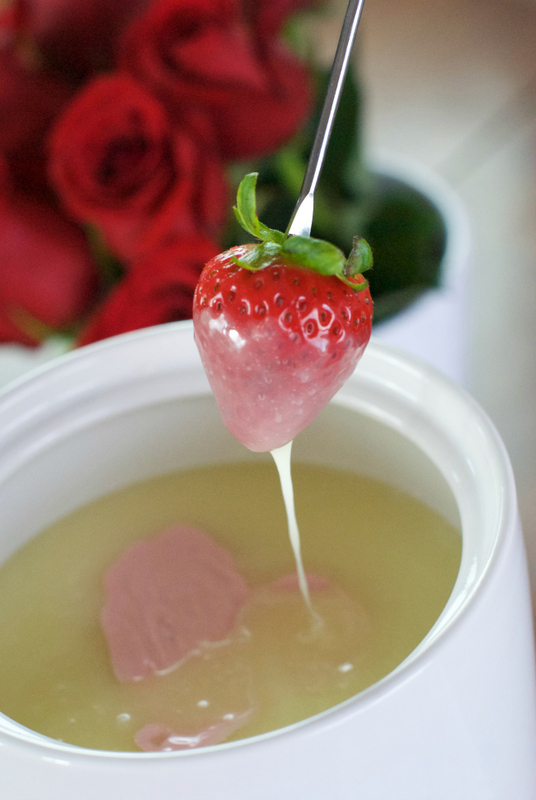 We can’t think of a better way to spend an evening together with friends than this fun fondue Valentine’s Day party! 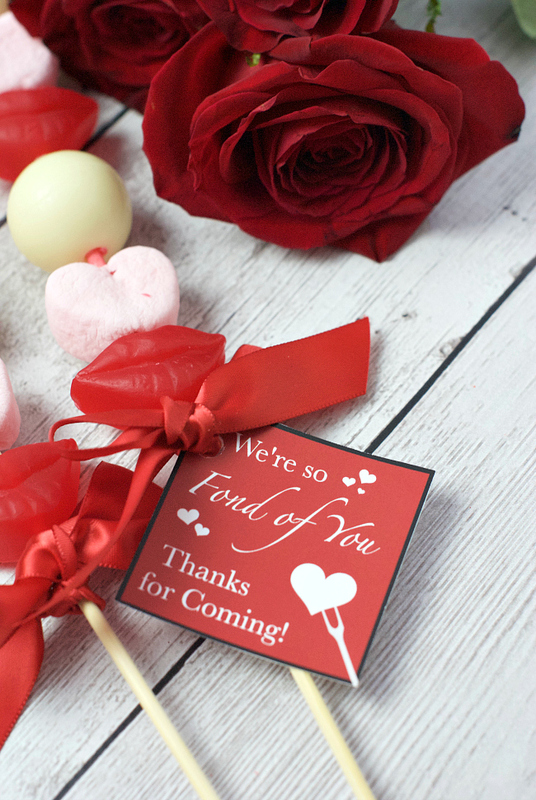 Throwing a couple’s Valentine’s Day party doesn’t have to be a ton of work. 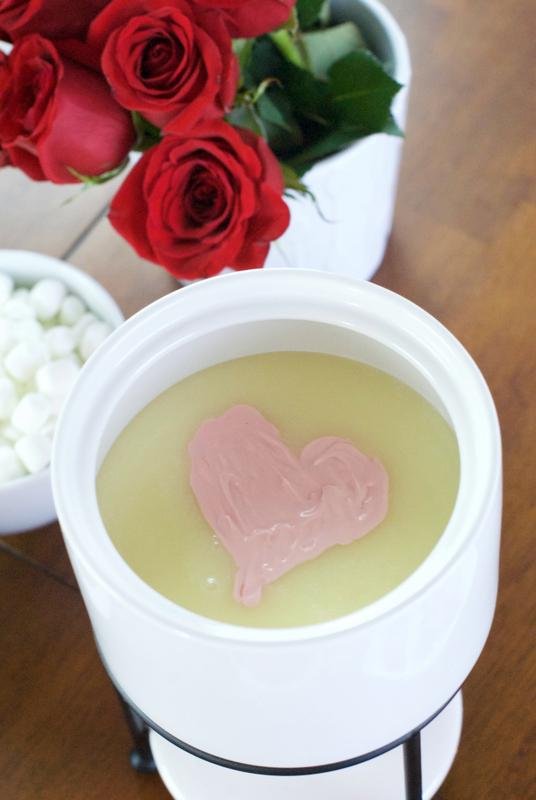 Fondue is pretty easy to pull together and we’ve got a fun Valentine’s party game ready for you to print and play, so you have no excuse not to throw this fun fondue party this year! 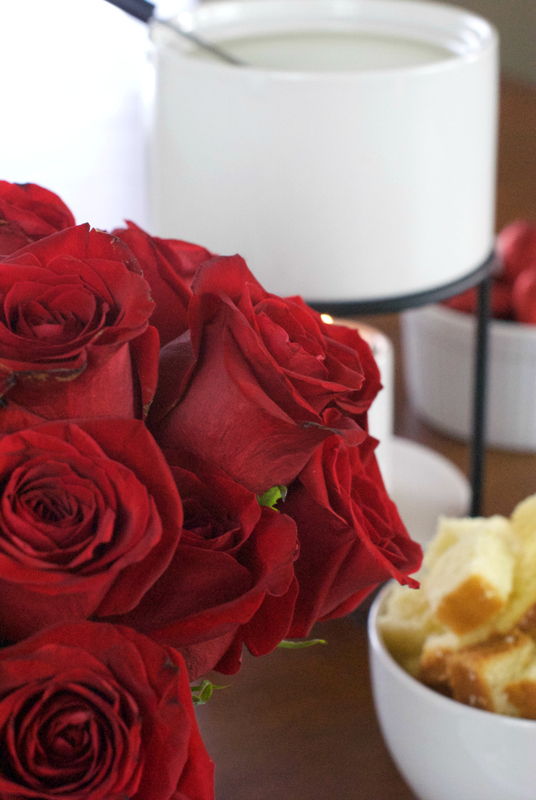 We kept things super simple with the decor, we used red roses (because hello…it’s Valentine’s Day) and white dishes. We love the way the table looks…just simple but gorgeous! We wanted our invitations to be kind of elegant to match the party. 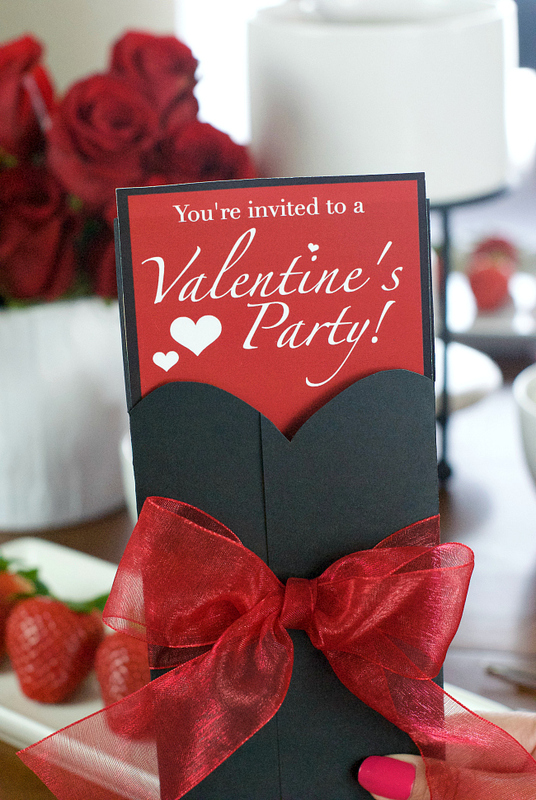 We printed out a red invitation and then wrapped it in black cardstock (and cut a heart shape in the top) and tied it with red ribbon. 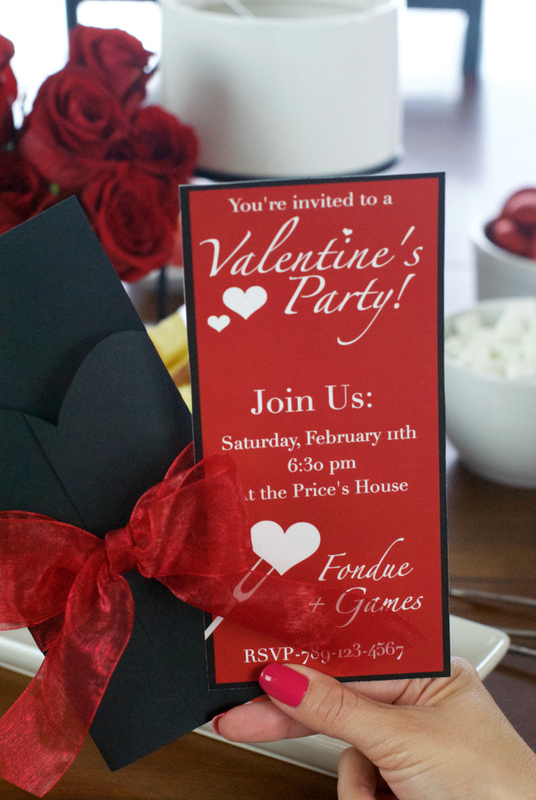 We have a template that you can use to create your own invitations. If you don’t know how to personalize this, no worries. We’ve got a tutorial here that will walk you through that. We made a white chocolate and coconut fondue. 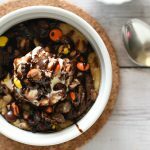 It is a little different spin on your basic chocolate fondue, and it was delicious. Maybe have a milk chocolate and a white chocolate one if you want both! Mix the chocolate chips, coconut oil, and heavy cream in a pan on the stove over medium heat. Stir until melted and combined. Add coconut extract to taste. And enjoy! Now the real fun of this party (other than eating of course) is this fun game! This is such a fun way for you and your guests to interact and find out more about one another. We promise you’ll laugh so hard at some of the answers the couples will come up with. 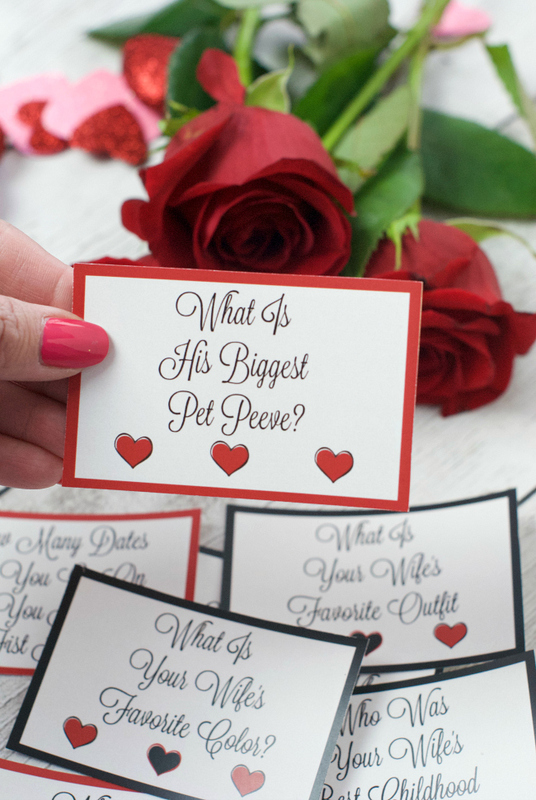 This Newlywed Game type of Valentine’s trivia is a perfect way to start or end your fondue party, here’s how to play. You will have two rounds, both being worth a different amount of points. Maybe the first round all questions are worth 5 points and the second round each question is worth 10 points…something like that. You will also need to decide how many questions you want in each round. We have given you 14 questions for each spouse (men and women). But remember, you may need a question or two left for a tiebreaker at the end of the game. The first round, have the men go in another room. Make sure they go far enough away they can’t hear what the ladies are saying. While the men are in another room, give the women a piece of paper and pencil to write their answers down. Then read the questions to the women using the question cards with the red border. Again, you have predetermined how many questions per round (we would suggest 5 questions per round, leaving you some bonus questions for the end). After you have asked all of the questions for that round, invite the men to return to sit by their wife. Make sure the ladies cover their answers so their hubby’s can’t see! Read the first question you asked the ladies out loud for the group to hear, giving the men a few moments to formulate an answer. Start with a couple, asking the husband to respond to the question. He gives his answer out loud for the group to hear. After he states his answer, his wife will reveal the answer she wrote down. If the answers match, they receive the points. It will be up the the group to determine if answers match or not if there is a close one! Repeat this process until all of the questions and answers have been revealed. It’s now time for the ladies to step out of the room. You will repeat this process, but this time you will read the men the questions with the black border. Again, reading the same amount of questions you read to the women. Have the men write down their answers and then cover them up before the ladies return. Ask the question out loud giving the women time to come up with an answer and then start around the room. Once all of the questions have been answered that is the end of round 1. Round two will be the same, the only difference is the points each team will receive for their answers. Maybe save the harder questions for round two. Sometimes it’s fun to have a bonus round, with one or two questions (the hardest ones) being worth a lot of points. You can decide if a bonus round sounds fun. If you do, it would be the same process but only asking one question to each spouse. If there is a tie, ask the couples who have tied a tie-breaking question, the couple who answers correctly wins the game! Most importantly, this is a game…so have FUN! Here are all of the cards, ready for you to print. 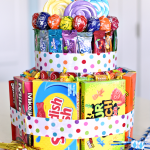 When we throw a party we often like to have a fun little take-home gift to go with it all and send everyone home with a smile at the end of it. 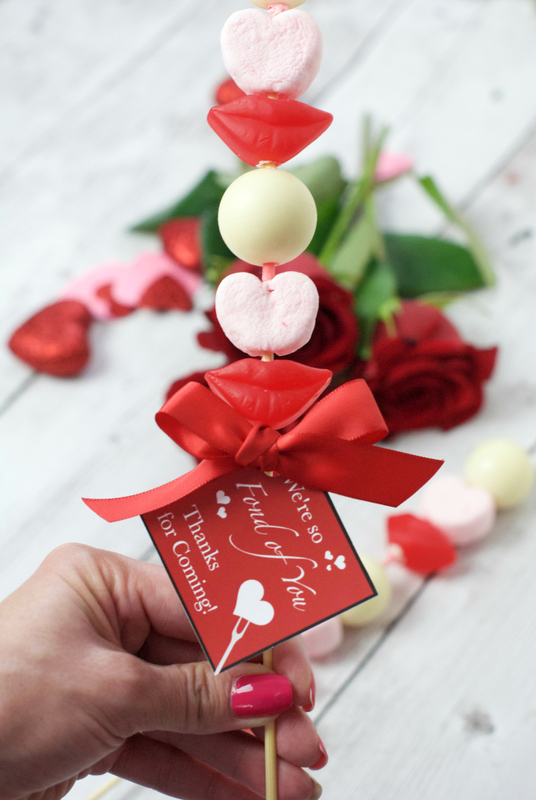 We made these fun little Valentine’s kabobs using white Lindt truffles, red hot lips, and Valentine’s marshmallows. Then we added a little tag saying we’re so Fond of You (get it?) and attached it to the take home. 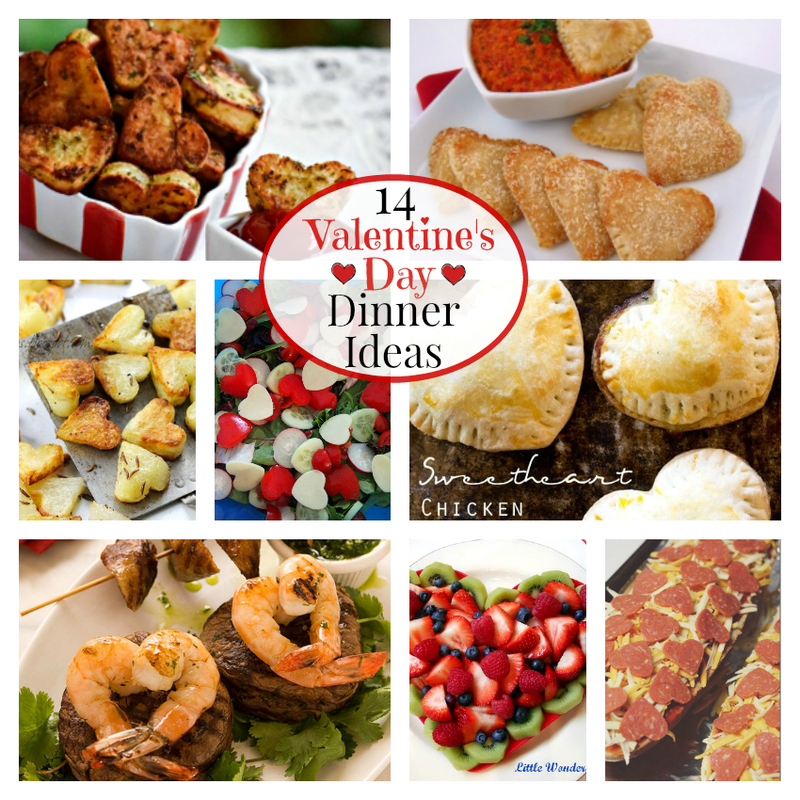 Have FUN at your fondue Valentine’s Day party!! Wow! What a fantastic idea. It all looks so classy and yummy! 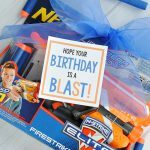 Love all the details in his Fondue Party! So amazing and the treats looks so delicious. Thanks for sharing these feast for the eyes and yummy for the tummy inspiration! Such a fun party! I love the game and the take home party favor! 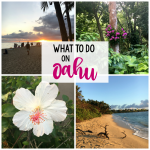 I love reading all your fun ideas! Thanks for the giveaway! You really have gone all out. Love what all you had done for such a great party. Thanks for all the awesome links! Lots of great party people! !